Searching for Bonobo in Congo » Plants are Last — in the Forests of the Ituri and the Lomami. Plants are Last — in the Forests of the Ituri and the Lomami. ASANI, on right, marking a tree for measurement above the buttresses on our Ituri plots, circa 1990. We had been in the Ituri Forest for ten years. First we put radio collars on okapi, then on forest antelope. We did forest-wide large mammal inventories, and a study of leopard. It was somewhere after all of that mammal work, that we decided we could do plants. Plants always come last. The wall of forest along the Lomami River. And for good reason: In Congo there is no field guide, not even a complete flora or list of trees. And there are so many trees! Once we started, we worked for five years on plants in the Ituri Forest. We developed a good basic botanical knowledge of the central Ituri; not me, the botanical team, itself, built that knowledge. 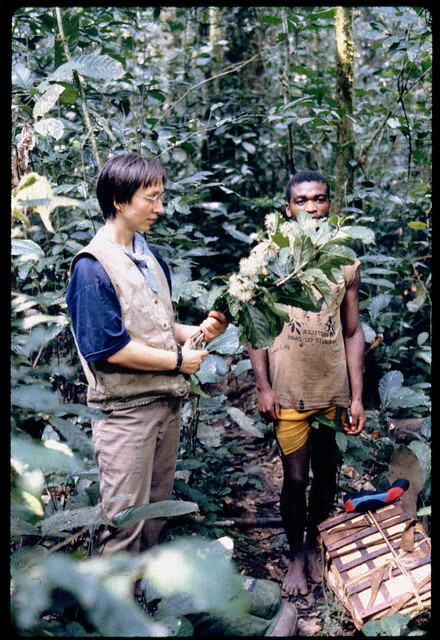 Collecting plants with ATOKA in the Ituri Forest, circa 1990. Now we have been eight years along the Lomami: time to do plants. But first I had to go back to the Ituri Forest to put together a team that would be able to build a similar botanical base for the Lomami. TAMBO and KOLE stripping Mbopi lianes to make camp stools, circa 1990, Ituri Forest. 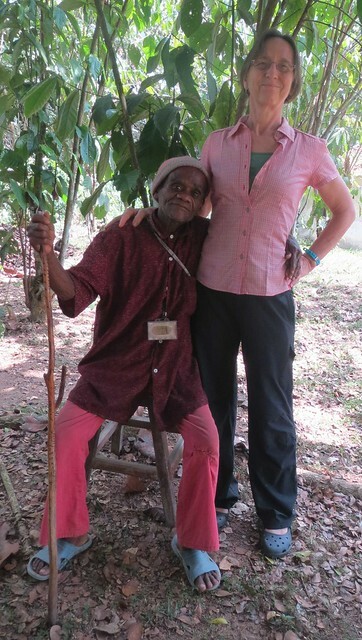 In the Ituri, in the 1990s, we found 714 species of tree, “treelet” and liana on just 40 ha. 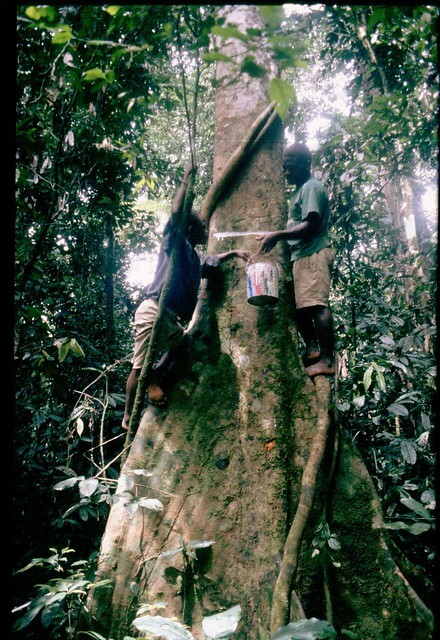 We discovered and described a large, new species of swamp-forest loving tree, Pradosia spinosa. The biomass – tree weight – is higher in the Ituri forests than on any of the other large forest plots being studied around the world. So, what are we going to find along the Lomami? Forest around poachers’ camp in the Lomami Forest. 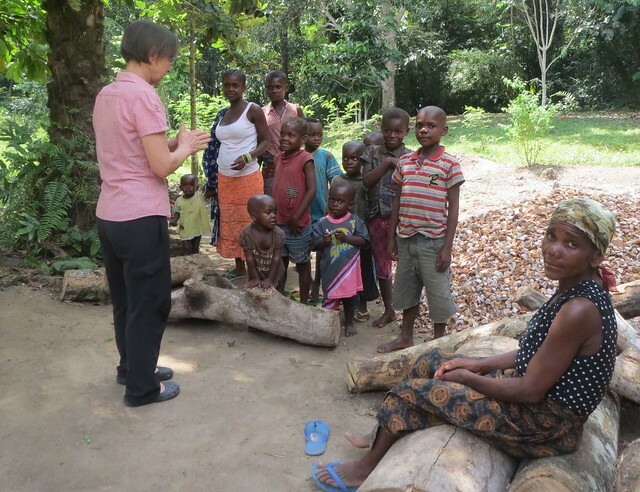 Congolese botanists –just out of college and eager to keep learning. For the Ituri botany, Corneille Ewango had been a student who used results from our 40 ha inventory for his Masters in USA and his PhD in Holland. 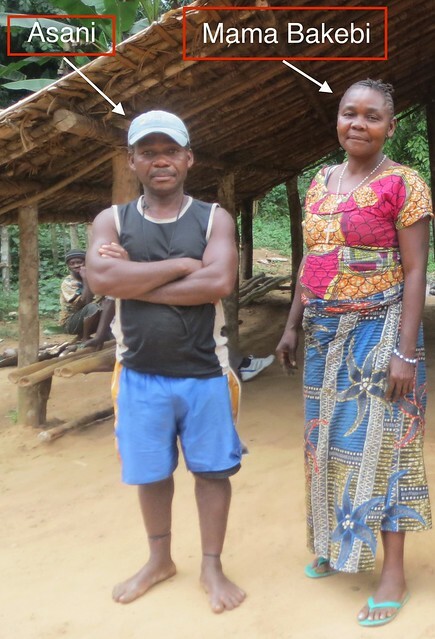 He is back in the Ituri, but ready to guide a new crop of Congolese botanists along the Lomami. 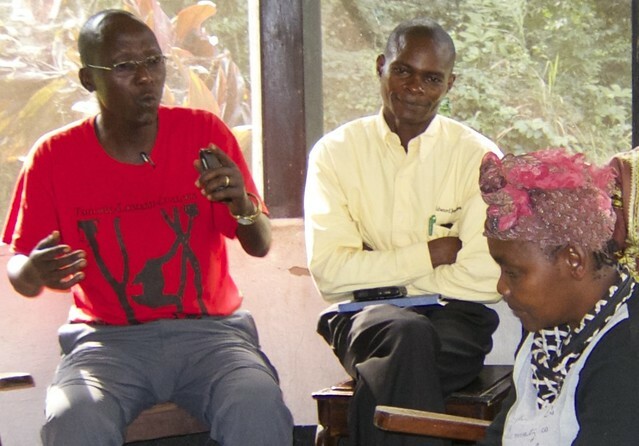 EWANGO (in yellow shirt) and DINO explaining to MamaBAKEBI in the Ituri Forest the plans and the needs for the Lomami. 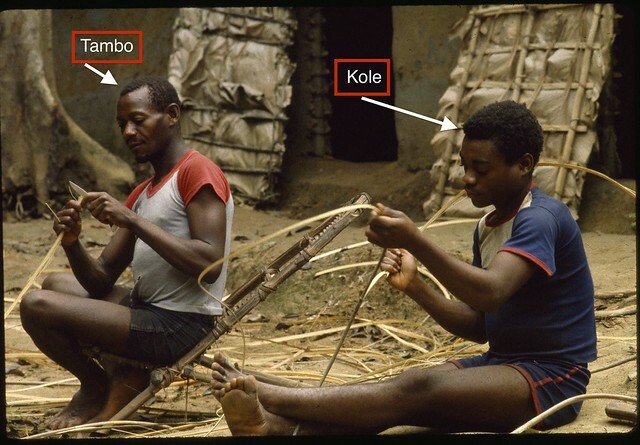 The Mbuti Pygmies –expert climbers and masters of the vernacular taxonomy. 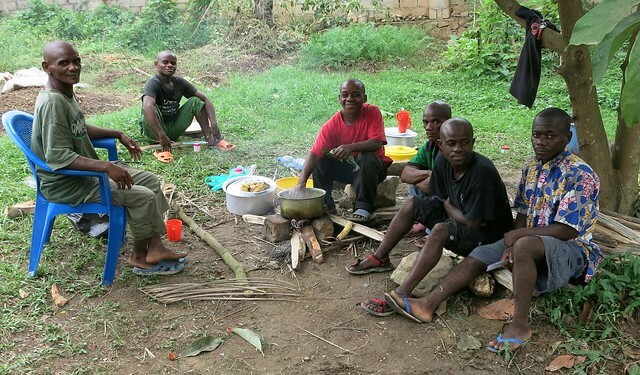 No place in central Africa has a denser population of pygmies (Mbuti) than the Ituri Forest. In the 1990s we had as more than twenty working for us at one time. I needed their help now to get up the new teams. To these two elements from the Ituri, we will add international botanists eager to learn more from the uncollected mysterious forests of the Lomami; we will add presses, dryers, collecting papers, logistics…. and the project will get off the ground. But first the trip to the Ituri. 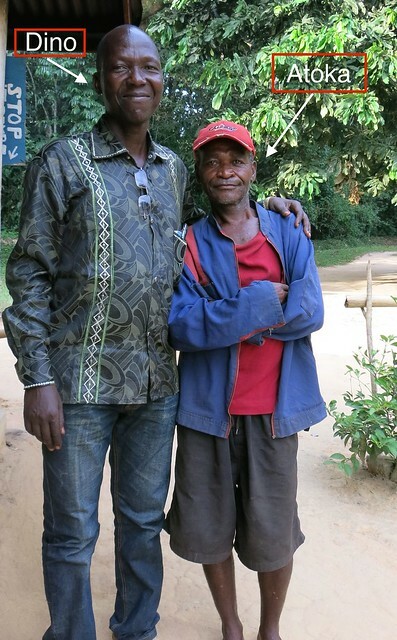 Dino and Atoka (both veterans of Ituri botany plots) reunited February 2015 in the Ituri. See photo Atoka above circa 1990. Dino, a veteran of the Ituri botanical plots and now with us on the Lomami (TL2) project, came along and worked closely with long-time Epulu-resident, Nobirabo, an excellent local negotiator. And why would negotiations be necessary? NOBIRABO in white sneakers during meeting February 2015 with Ituri Mbuti and Bakbala. In the traditional interstices of central Ituri lives, the Mbuti fall within a Bakbala system. The Bakbala are Bantu families with whom a clan of Mbuti has had relations for many generations. They rely on this familiar relationship with Bantu for interactions beyond immediate clan, with a larger society. In the mobile Congo of today, the Bakbala, themselves, generally poorly educated villagers, are barely able to make informed decisions. Still this was the system we used. MamaBAKEBI, bakbala to many of the Mbuti we work with, at home in the Ituri. ASANI by her side. See first picture above. There were meetings on the side where we were introduced to sons and nephews. KOLE’s (see above 25 years ago) wife (on right) brought Kole’s six children and two grandchildren to meet me. 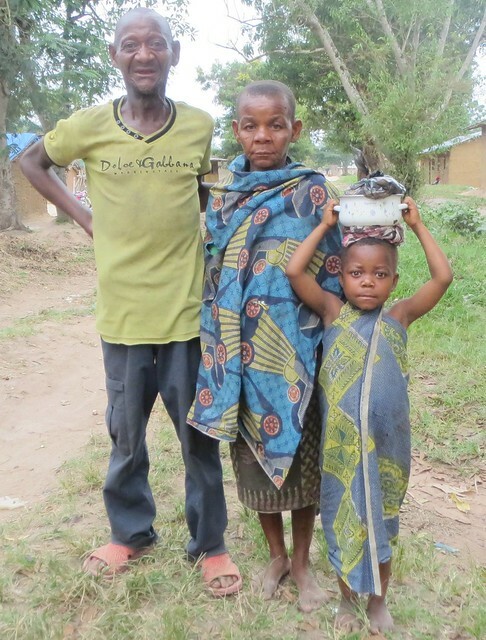 TAMBO, here with his wife and grandchild, met with us every day. He has the same wit for jokes as 25 years ago. I pose with ZAIRE. His son, ULELI, is the senior of the 6 Mbuti that returned to Kisangani with us. 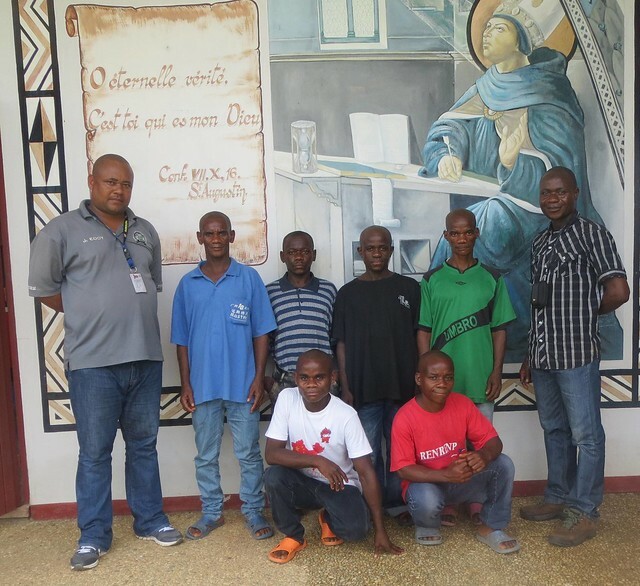 Finally a brave six were chosen and ready to set off to the Lomami…an entirely different part of the world. Here are the six Mbuti men eager and chosen to come, with several of their wives who agreed to stay behind. 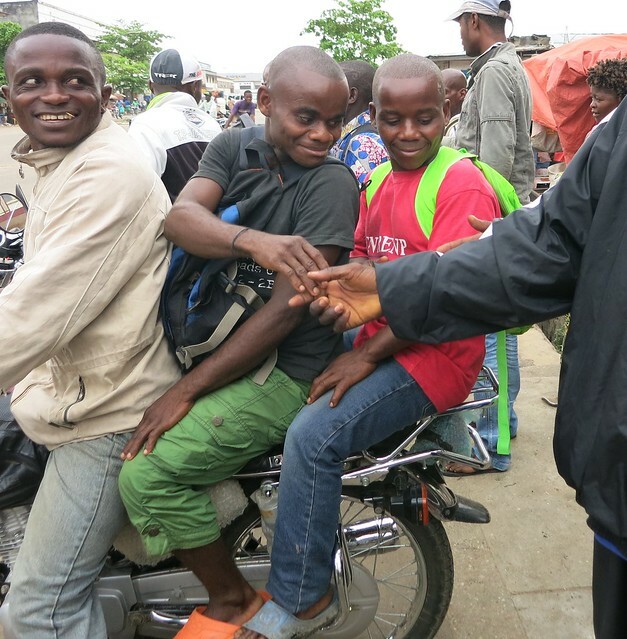 First, the 460 km to Kisangani. In the car. ULELI, ZAIRE’s son, is next to DINO. They called out the names of trees as we approached Kisangani, the trees that towered over secondary growth: TAFA, YAKO, MBELI … All was not unfamiliar. In Kisangani we bought mattresses and the six slept under mosquito nets on the little verandah. They had their fire in back …. But were eager to see more. Fire behind our Kisangani house/office. 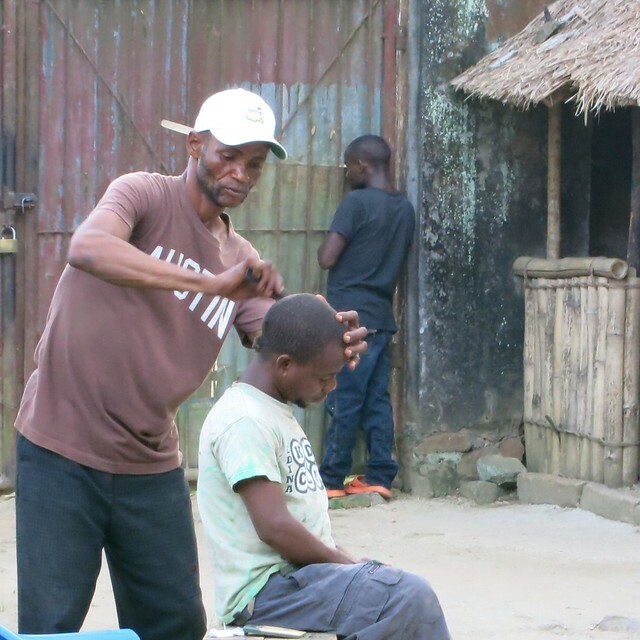 SAMUEL, our guard in Kisangani, gave everyone a hair shave. EMULA is peeking through a crack in the gate at Kisangani street life. 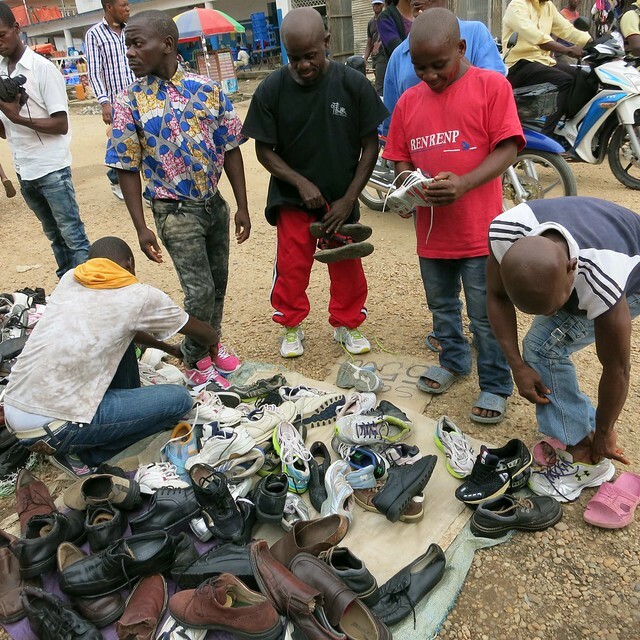 In Kisangani they are outfitted, sightseeing and quickly assimilating knowledge of a wider world. On motorbike taxis to market. They are easily recognized as Mbuti and everyone wants to shake hands. A rare sight! We got good second hand shoes. We bought backpacks. They examined the used clothes displays. 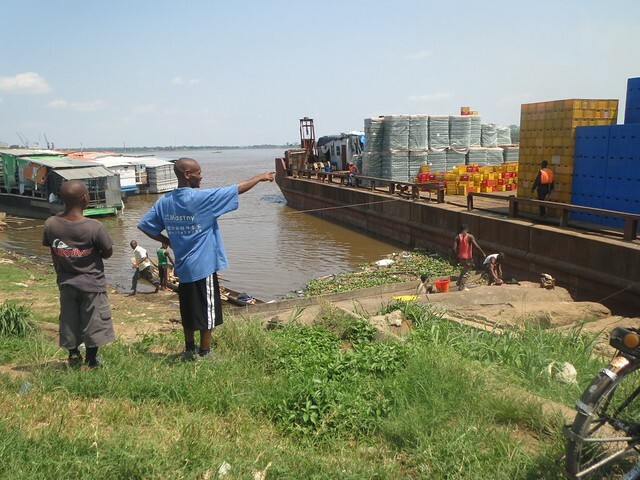 They spent hours down at the Congo River watching the big barges and smaller house boats. They even got to do some sightseeing at churches and schools. 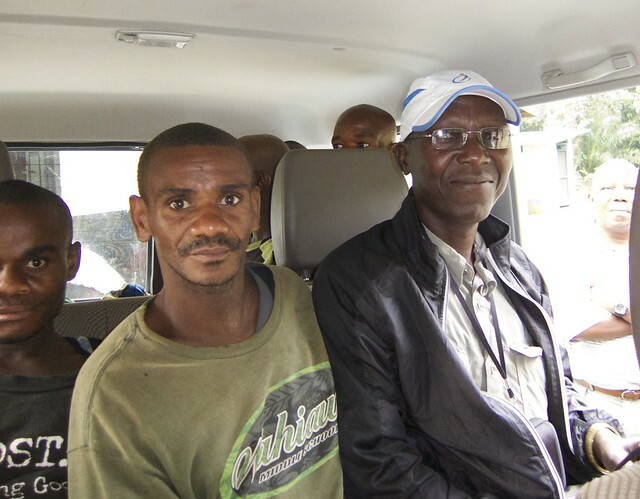 On the right is GILBERT, another old Ituri hand, who will accompany them, with DINO, on the next leg of their journey. 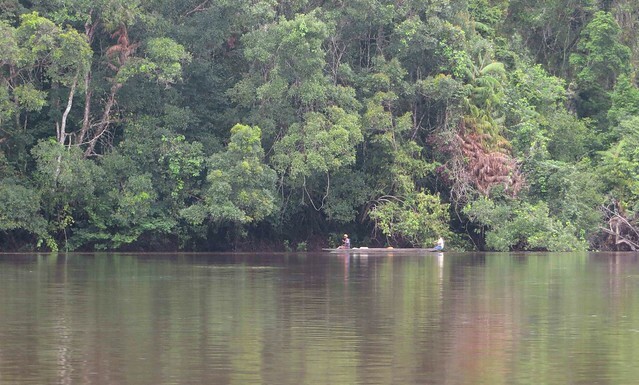 The next step towards the Lomami Forest will be riverboat upstream to Kindu. Dino and Gilbert will be along. They will take pictures all along the way. Another post later. 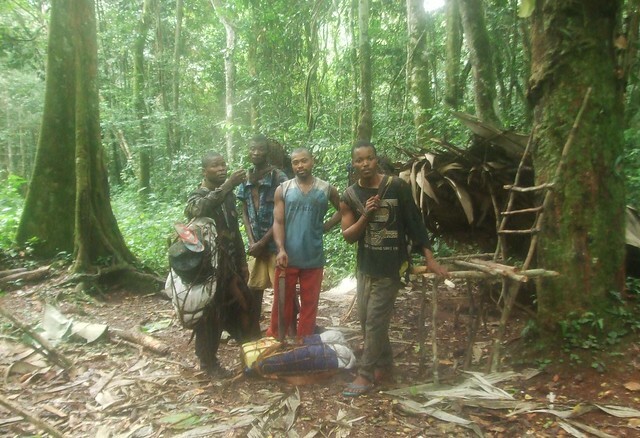 Mbuti Exodus: from Lualaba Barge to Lomami Forest Canopy. This entry was written by Terese Hart, posted on 2015-02-13 at 11:07 pm, filed under About the project, The Forest. Bookmark the permalink. Follow any comments here with the RSS feed for this post. Trackbacks are closed, but you can post a comment. Great photos, great recap. Amazing to see it evolve over so many years with many awesome human beings too. Bon courage!!! Looking forward to the updates! Simply amazing !!!! One day, I will visit you.